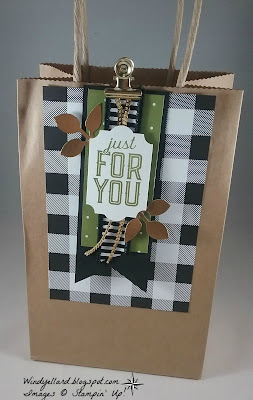 I made this bag for a special guest at a class this week. Christmas bag for her. 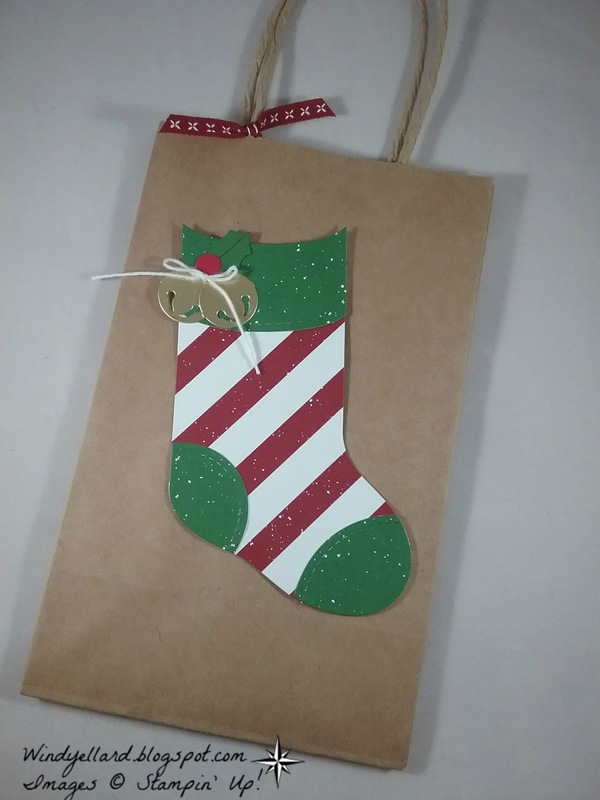 I used the Be Merry DSP to cut the stocking and pieces. Trim Your Stocking framelits dies. 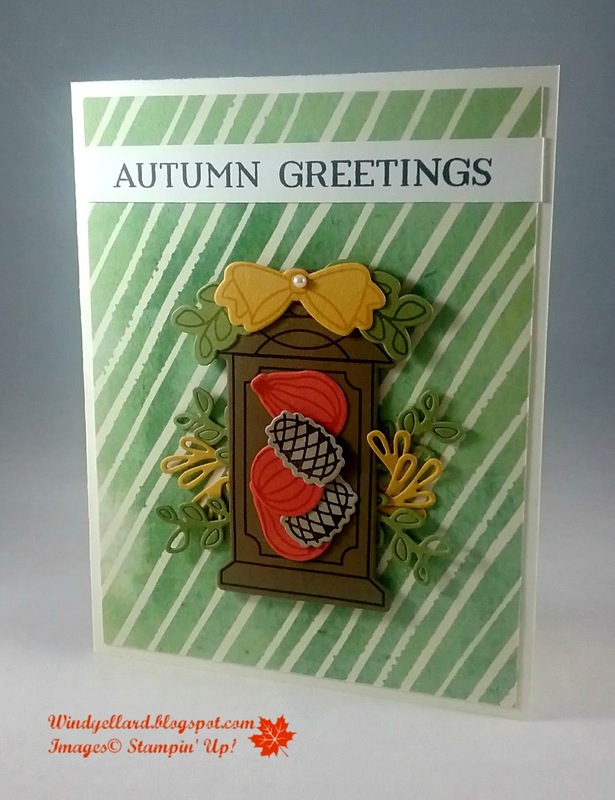 color the flowers and leaves-Pink Pirouette, Old Olive and Daffodil Delight. 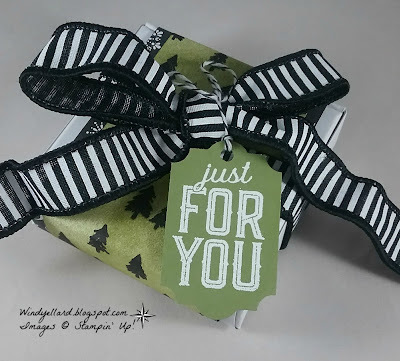 I stamped first in Memento Tuxedo Black on thick Whisper White. 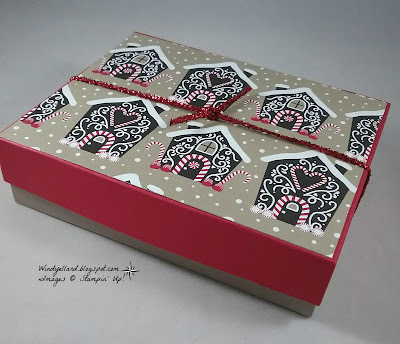 and added some enamel dots in Pink Pirouette. 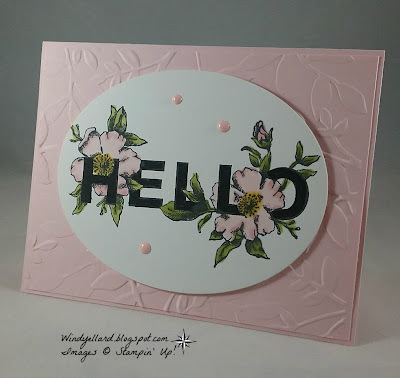 with the Layered Leaves emboss folder then on a Pink base. I designed 4 of these bags for some friends! and punched with the matching Everyday punch. I placed it on the bag with a gold clip. 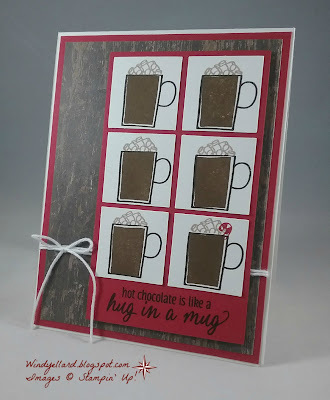 and the card from yesterday! I used a Oh My Stars emboss folder. 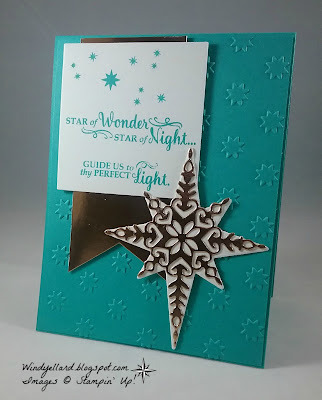 I stayed with the matching stamp set called Star Of Light. The star is copper foil with Whisper White behind. The copper banner pulls it together. I had some leftover pieces from my October classes I finally put together. I stamped the sentiment from Night in Bethlehem set in Bermuda Bay. I added some stars from the same set. on a piece of Bermuda Bay embossed with the Sparkle emboss folder. I placed it on a Bermuda Bay base to finish it off. Hope you have a lovely and blessed Sunday! 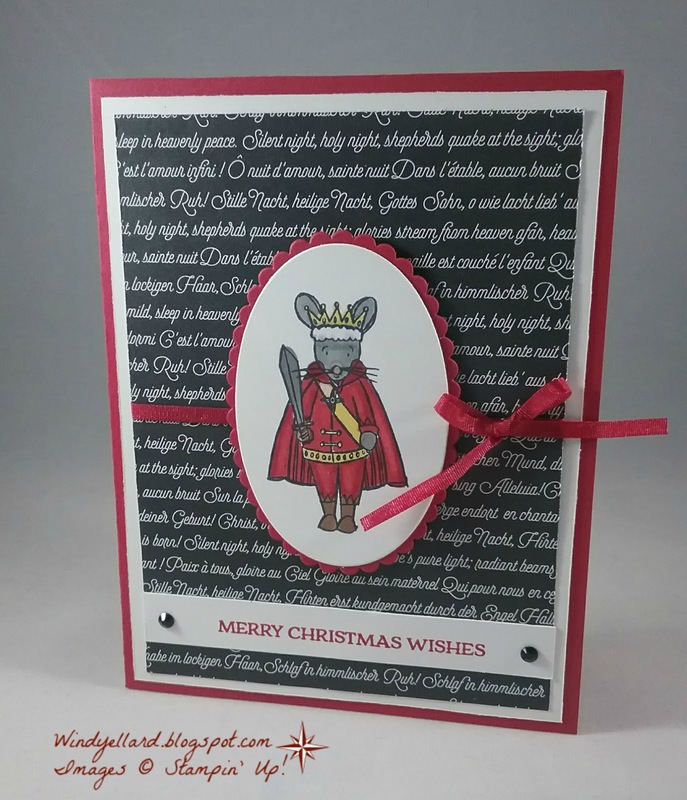 The Mouse King, Oh My! 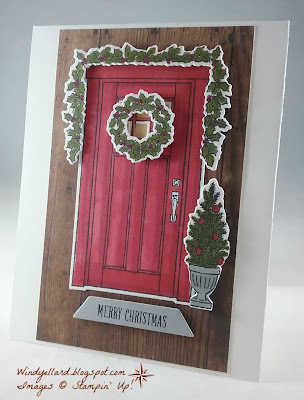 Again, playing with the Stampin Blends markers and the Sugarplum Dreams set. and Crumb Cake. I layered him on the ovals and the leftover pieces from a card class. The sentiment is from Santa's Sleigh stamped in Real red. I finished it off with some bling-black rhinestones and the 1/8" Real Red ribbon. 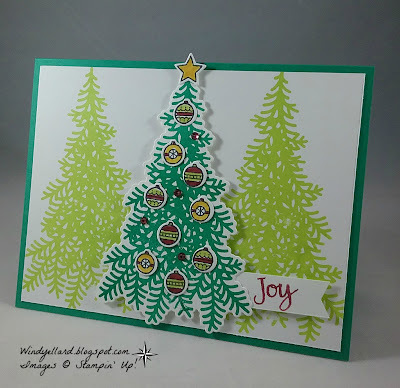 This is another image I colored with my Stampin Blends markers. 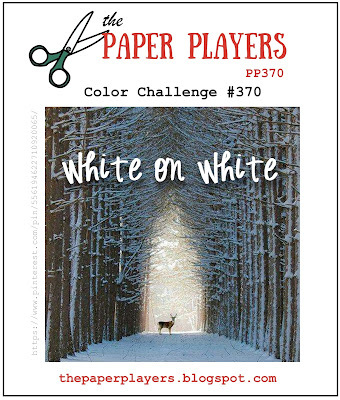 I colored with Cherry Cobbler, Smoky Slate, Daffodil Delight, and Ivory. in red and then I did it again in blue which I will post at a later date. 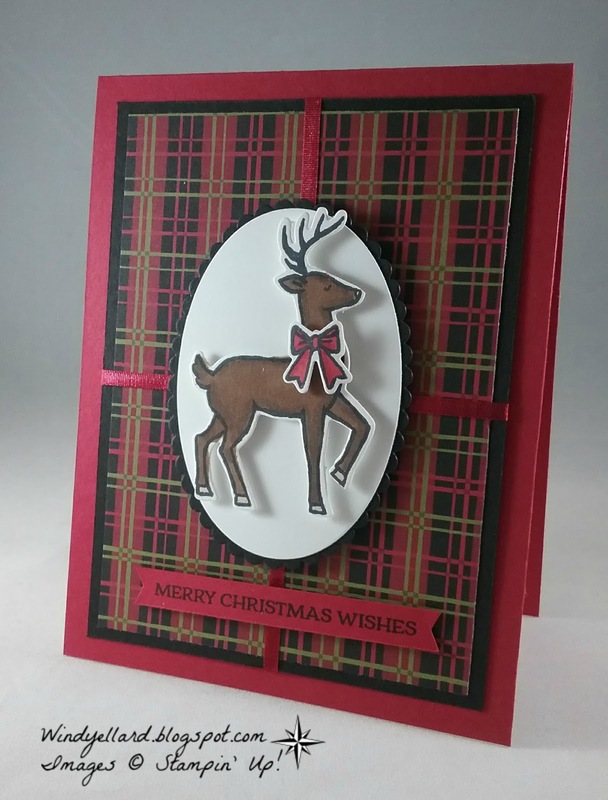 had to cut the image with a oval and layer with a Real Red scallop oval. 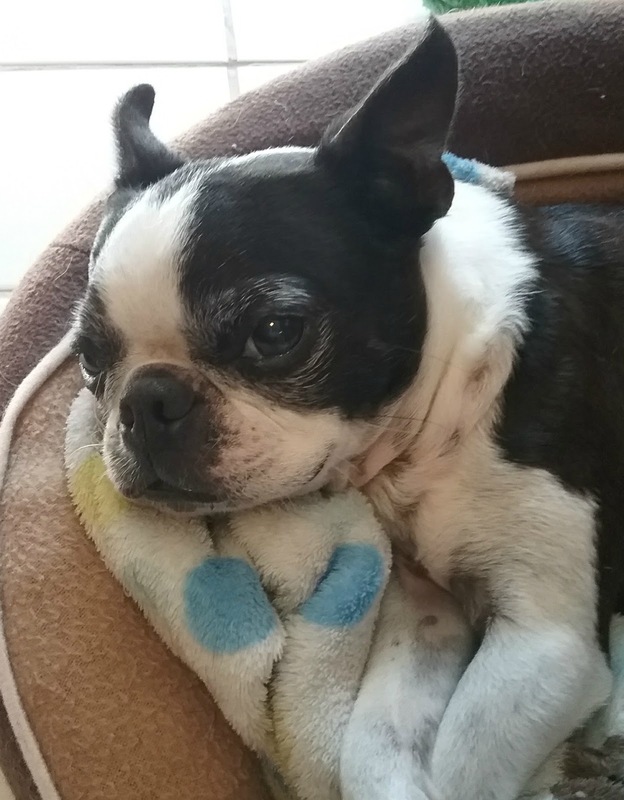 First, A Happy Thanksgiving to all! We go out to eat after watching the Macy's Thanksgiving Day parade! on a little online shopping! a Real Red candy cane to one of them! off with some white twine and a bow. Have a blessed Thanksgiving and a wonderful weekend! the Crumb Cake markers and the lid with Cherry Cobbler. of hot cocoa plus some snowflakes would be great inspiration. 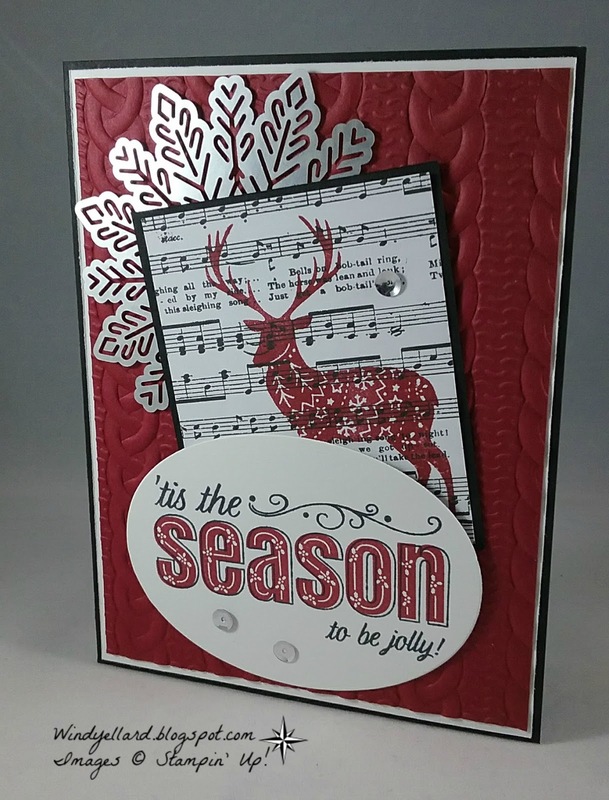 The sentiment is from the Hug In A Mug set, the snowflakes plus the "steam"
are dies from Swirly Snowflakes and the DSP is Quilted Christmas. Two For One Birthday Cards! 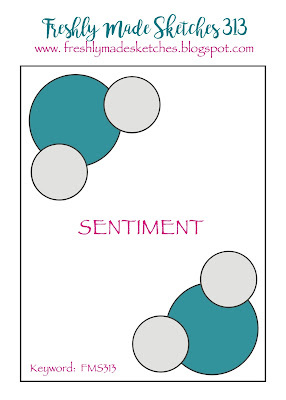 I have two cards for you today! I was asked to make these for a friend. 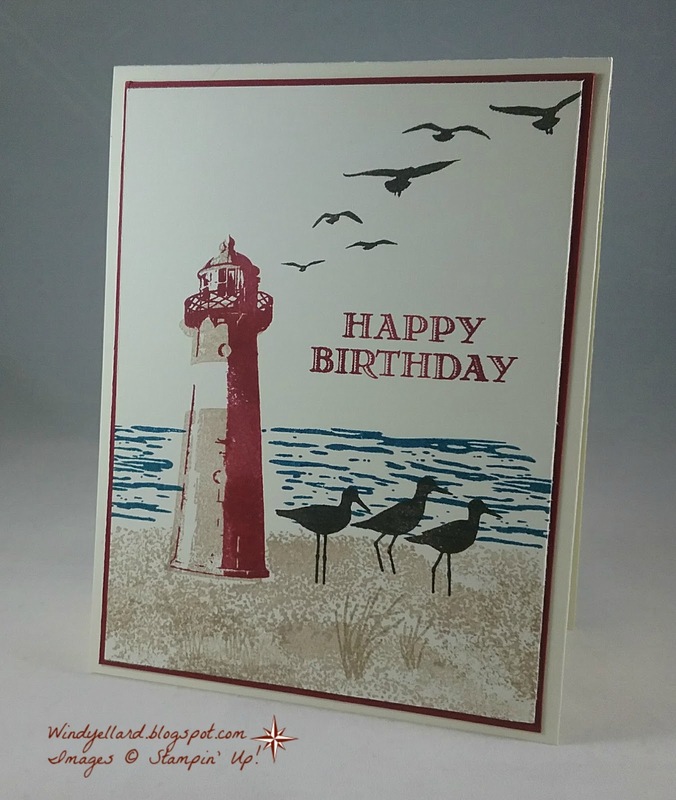 Card One: I stamped this card with the High Tide set. I pulled my classic colors-Crumb Cake, Island Indigo and Cherry Cobbler. These colors are prefect for this set! I did used the sentiment from Guy Greetings to finish it off. 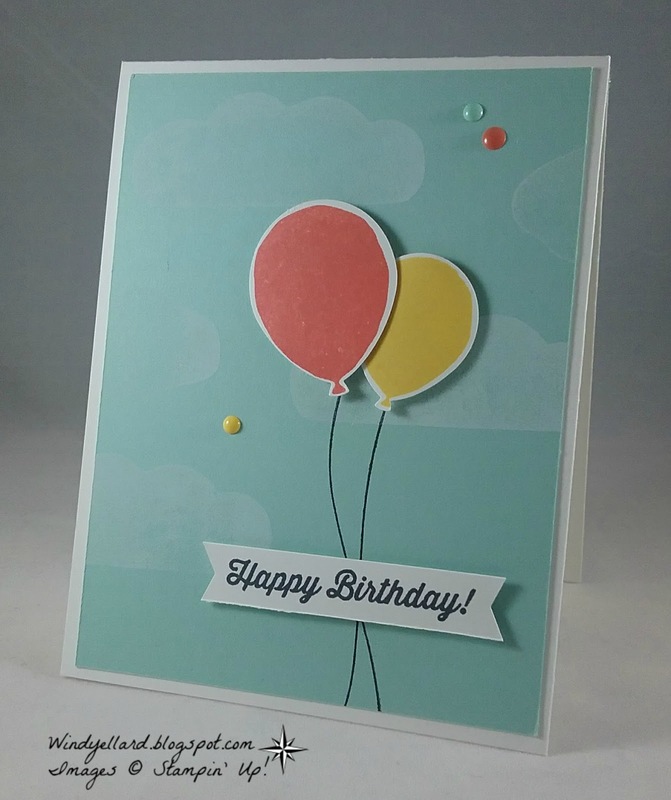 Card Two: I used the Balloon Celebration set with a Pool Party background. well in the photo here. I stamped the balloons in Calypso Coral and Daffodil Delight. 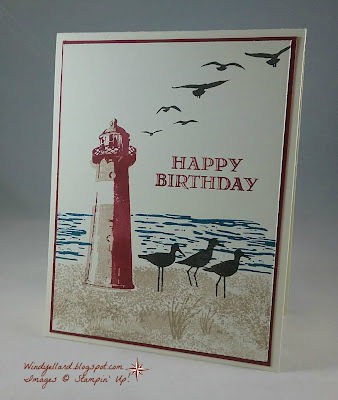 I grabbed from Birthday Banners stamp set. I used the balloon punch and popped them up. I finished it off with some enamel shapes. I hope you have a doubly blessed day! 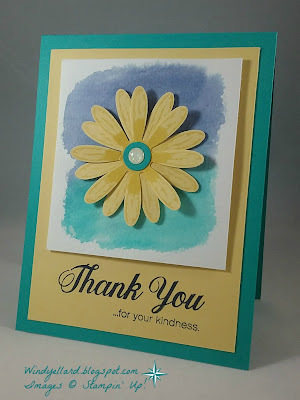 when I received my new Stampin' Blends markers. on the greenery with more Cherry for the berries. 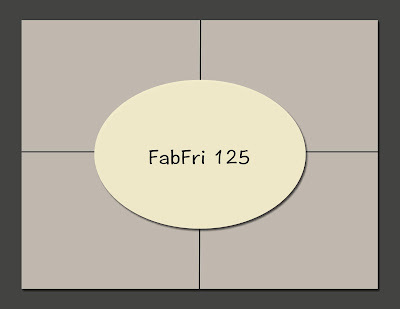 cut a Smoky Slate mat for my sentiment. thick Whisper White for the base. in the door for a light on look. in that same color for the snowflakes in the Colorful Season set. I used the dies from Seasonal Layers with thick Whisper White for my cut snowflakes. in the center. Some rhinestones for bling finished it off. I used the angled DSP from Painted Autumn...love those watercolored stripes! I did much die cutting with the Lantern Builder framelits dies. I also used the matching stamp set with the lovely sentiment or greeting! I sent this off to my dad and step mom the day I made it for a Thanksgiving card. 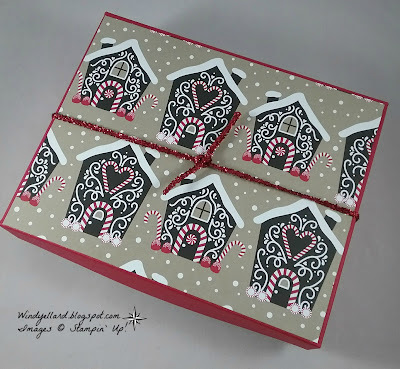 and added the thin 1/8" Real Red ribbon to make the four "boxes". with a little Ivory on the hooves and Cherry Cobbler to color the bow. I cut them out with the matching dies from Santa's Sleigh thinlits dies. I layered him on a Whisper White oval and a black scallop oval. stamped in Memento Tuxedo Black on Real Red. Kind of a sharp looking card! Hop you have a wonderful day and thanks for stopping by! card stock on the bottom of the box and Real Red on the top. tinsel trim in Real Red around it. 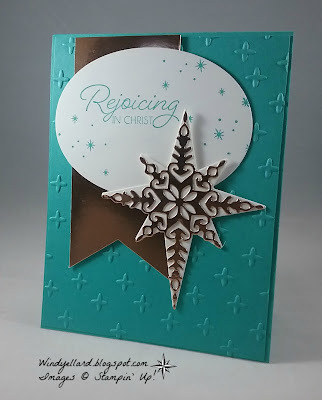 embossed with the Softly Falling emboss folder on it. from the matching set called Colorful Seasons in Soft Sky. I added some pearls to the snowflakes to finish it off. Go play along this week! I really wanted to use this set for this sentiment! It is a two step with the words and the detailed inside. 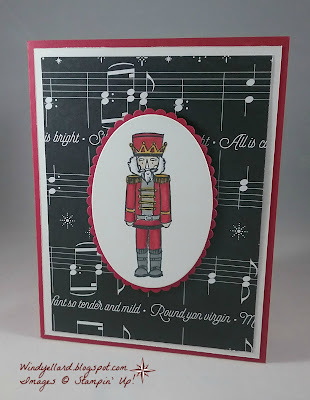 for Jingle Bells (that is the song on the sheet). 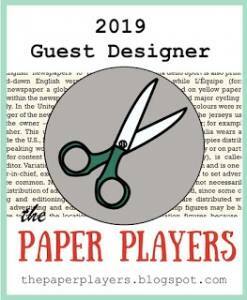 I layered it on a piece of Basic Black card stock. 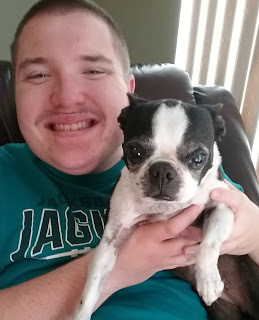 Hope you have a amazing day and thanks for stopping by! 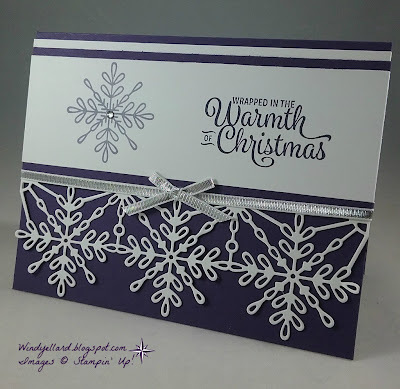 I just had to use purple on this fourth card for November card classes. silver with the 1/8' ribbon and bow plus a Wisteria Wonder snowflake. 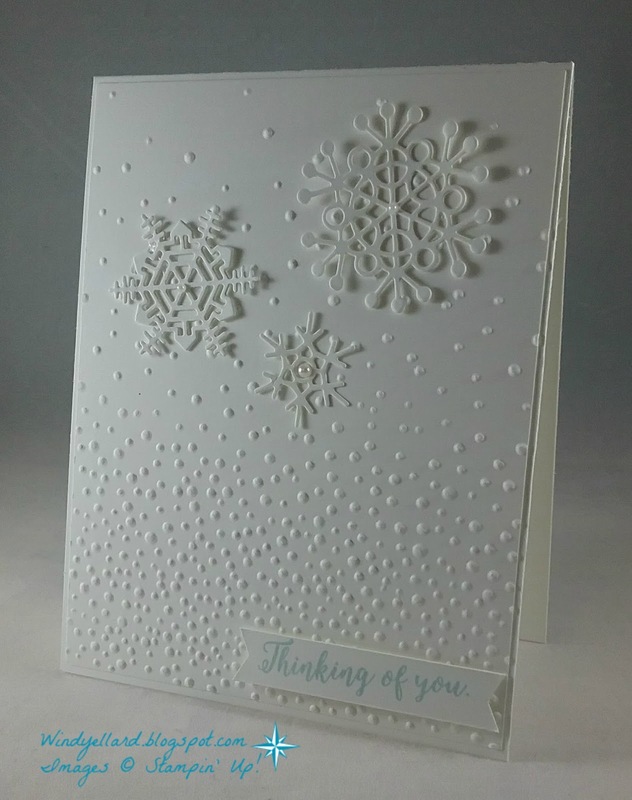 plus snowflake from Snowflake Sentiments set. 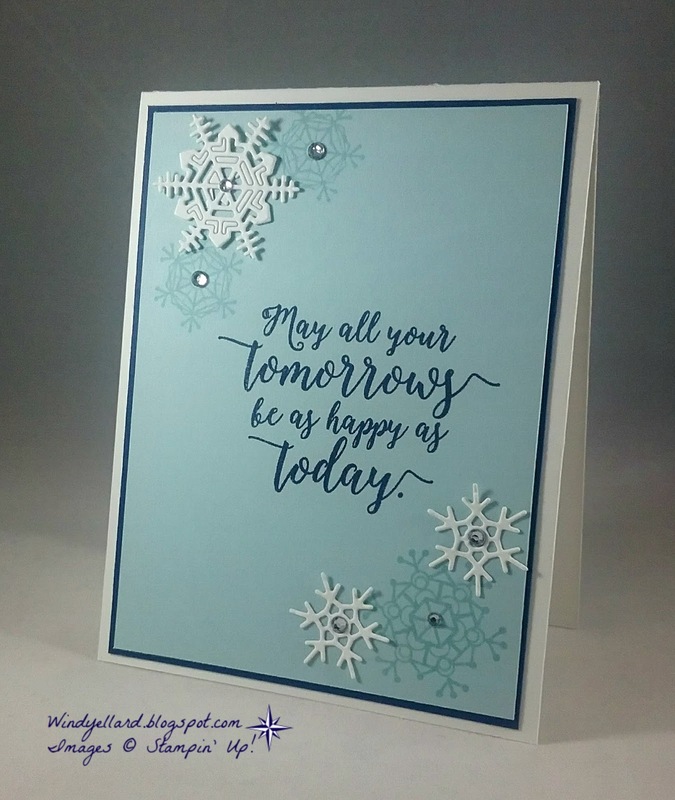 I added some more bling with a rhinestone in the middle of the snowflake. 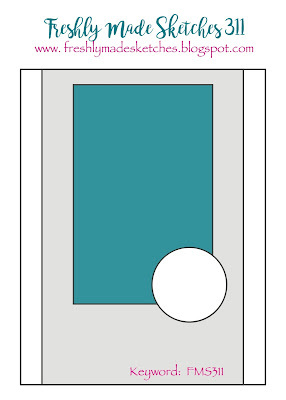 Simple and clean card for you! literallymyjoy.com for my third class card. 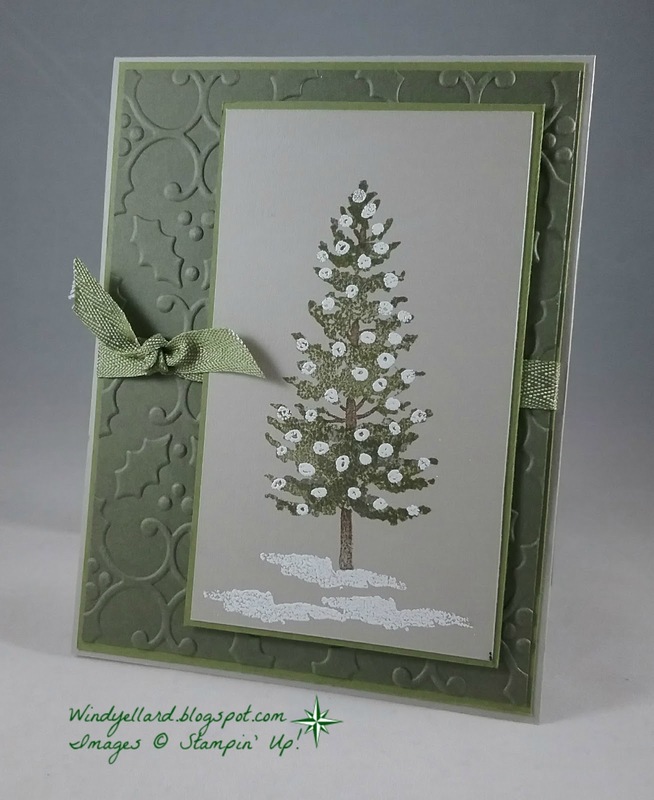 I used the holly emboss folder with Always Artichoke for the background. I layered it on a piece of Old Olive and a Sahara Sand base. I then stamped on a piece of Sahara Sand and layered it on more Old Olive. and Always Artichoke and the trunk in Soft Suede. 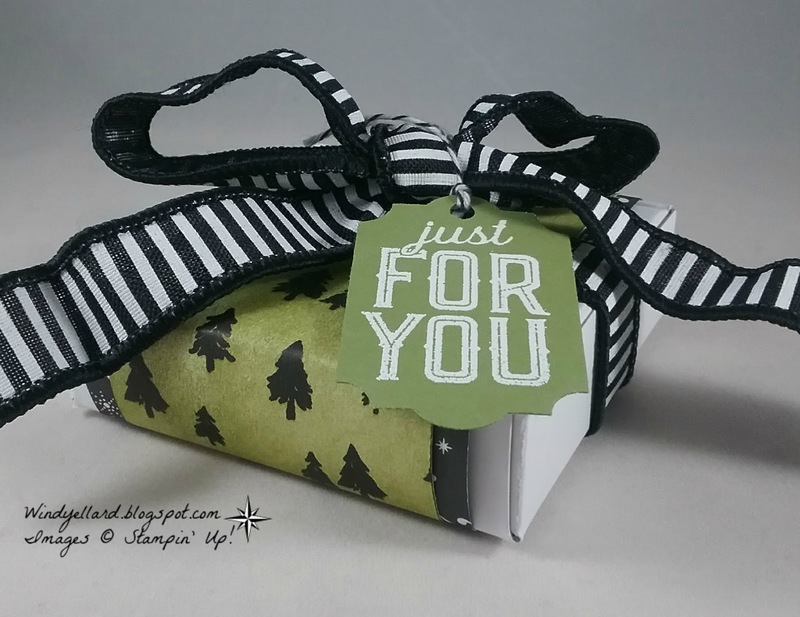 with some 3/8" mini chevron ribbon in Old Olive. 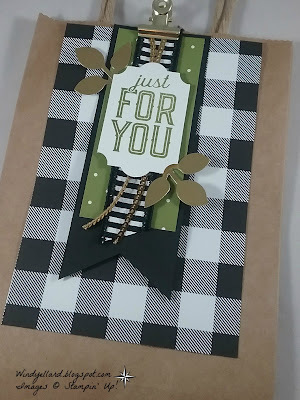 A sweet sentiment inside would finish off the card. 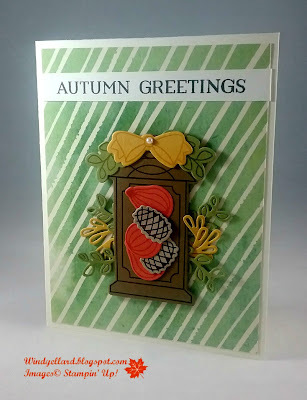 and thought it would be great for my second card for November card classes. I love the sentiment which was why I bought this set! 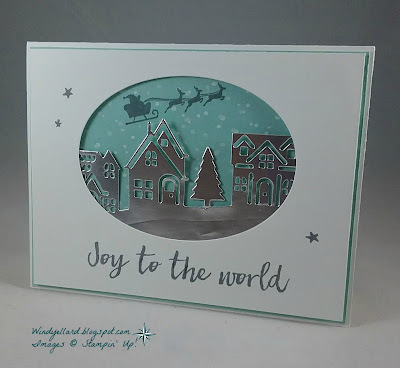 from the Christmas Around the World DSP. 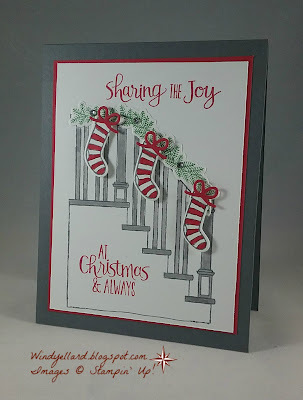 I stamped the santa/sleigh in Basic Gray as well as the sentiment and little stars. 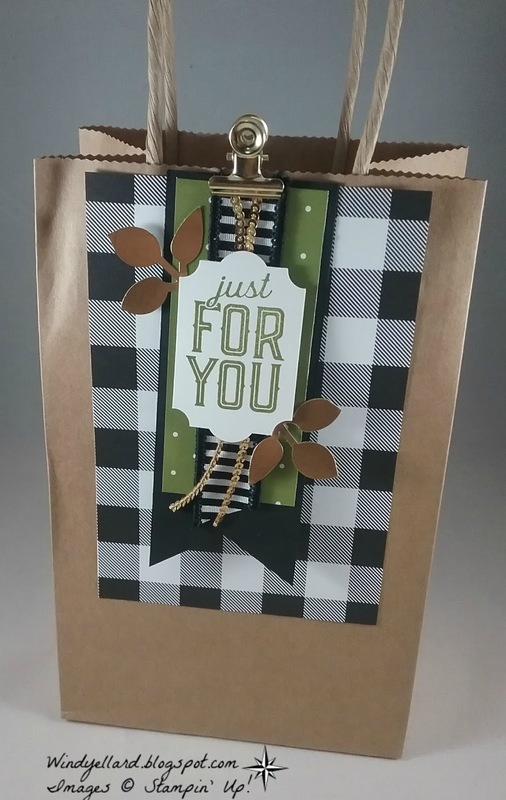 I cased right out of my Stampin' Success magazine for SU! demos. This is the first card for November Christmas card classes. 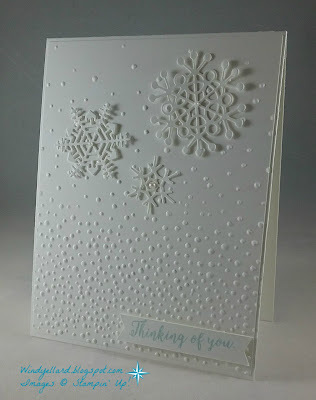 I love the texture from the Quilt Top emboss folder with the white. I also love the plaid from Christmas Around The World DSP. like crumb Cake on the lantern and Garden Green on the candle and leaves. 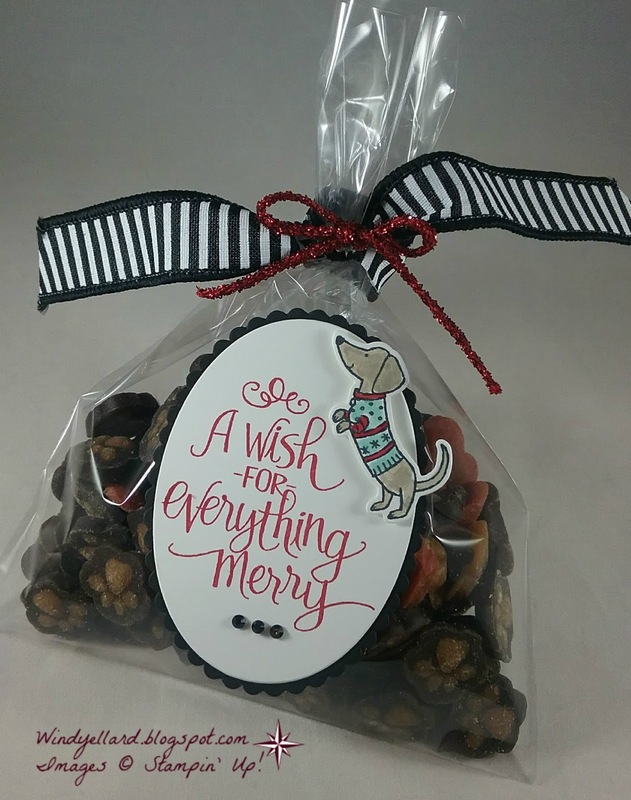 I did grab the bow die from Christmas Stockings thinlits dies and cut in Real Red. All layered on a Crumb Cake base to finish up. with the sentiment in Real Red on a Whisper White oval. I layered a Basic Black scallop oval behind and added some black rhinestones. Sahara Sand. I colored his sweater with Real red and Pool Party! 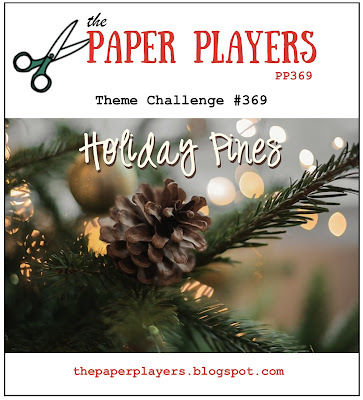 with pines for this card when I saw the challenge. Quilted Christmas DSP after deciding the red plaid was going somewhere on the card. Lemon Lime Twist card stock. 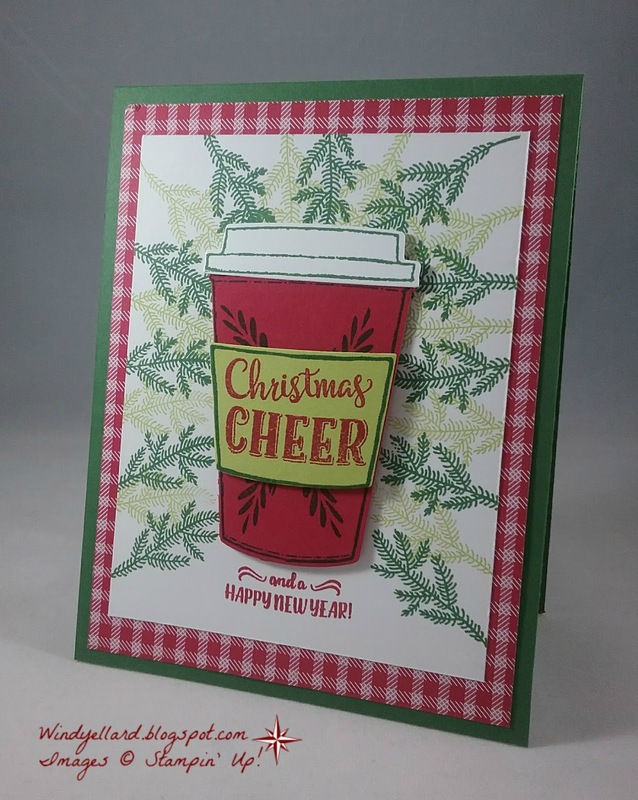 All was cut with the matching Coffee Cups framelits dies. I like how it looked like a center piece when I placed the cup on it. 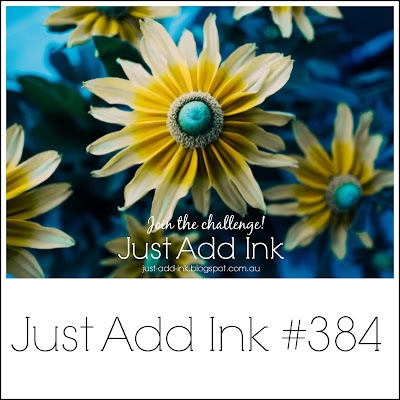 Just Add Ink 384 Thank You Daisy! I love the colors in the inspirational photo! I pulled out So Saffron, Bermuda Bay and Night of Navy. of Navy and Bay for a background. 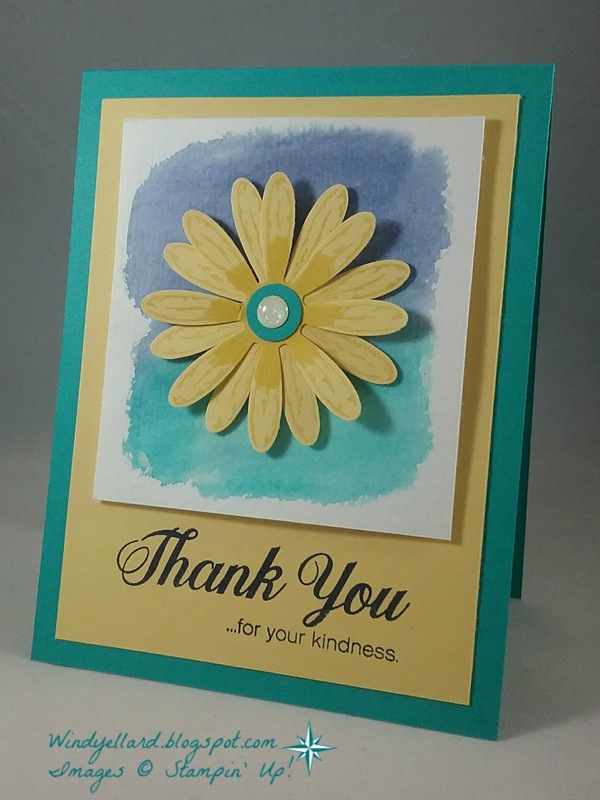 card stock twice and punched them out with the matching Daisy punch. to shade in the center portion of the leaves. 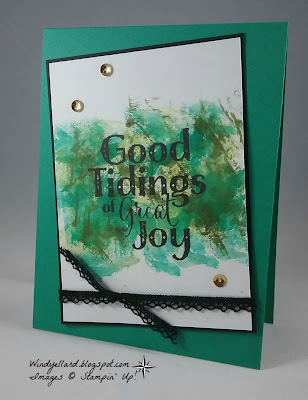 card stock which I stamped the sentiments in Night of Navy. All that was layered onto a of Bermuda Bay card base. for the inspirational challenge this week. I decided to go with bottom across for a cool box! 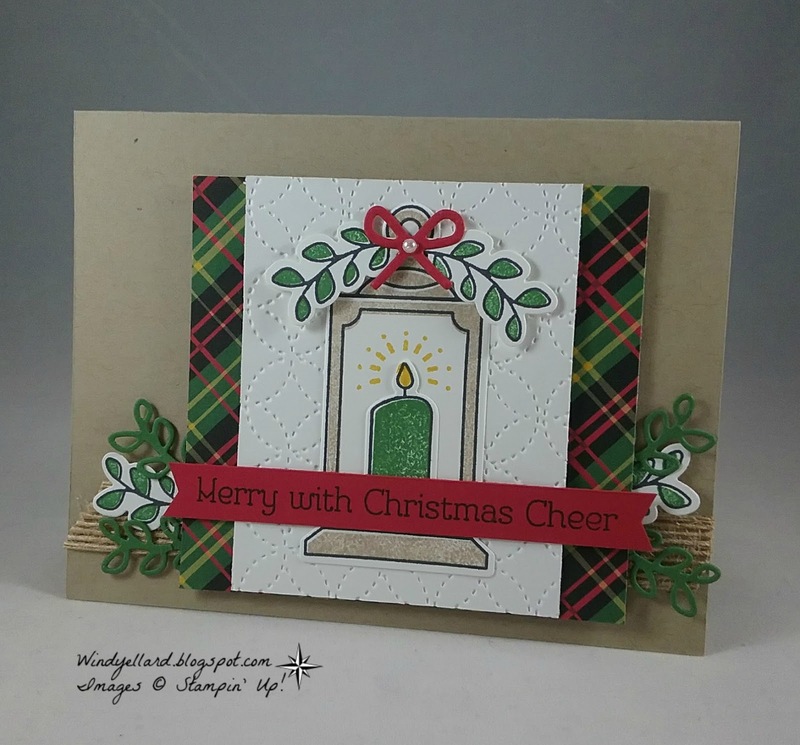 the tag in white on a Old Olive card stock with Merry Little Labels set. some black and white baker's twine. make it green. The bottom paper is the same DSP in another print. The box is the cute pizza box which I left white. I could use this dressed up box for any occasion! colored them with the Real red marker for the InkBig Design Team. and then colored the rails in Smoky Slate. I stamped two sentiments from the set that work together for a really cute card. Just a little rhinestones on the garland for bling to finish it up! 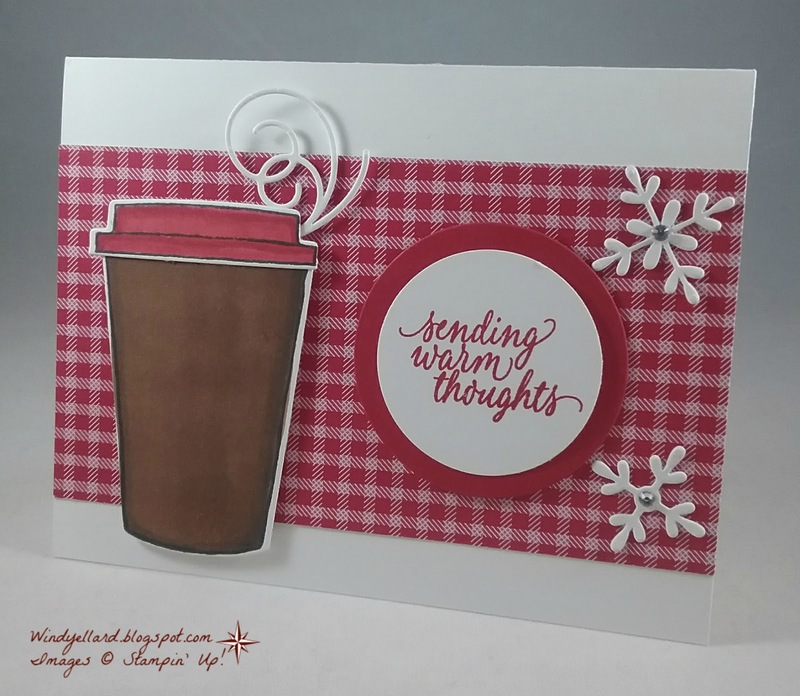 This is one of several cards I designed for the InkBig design team. 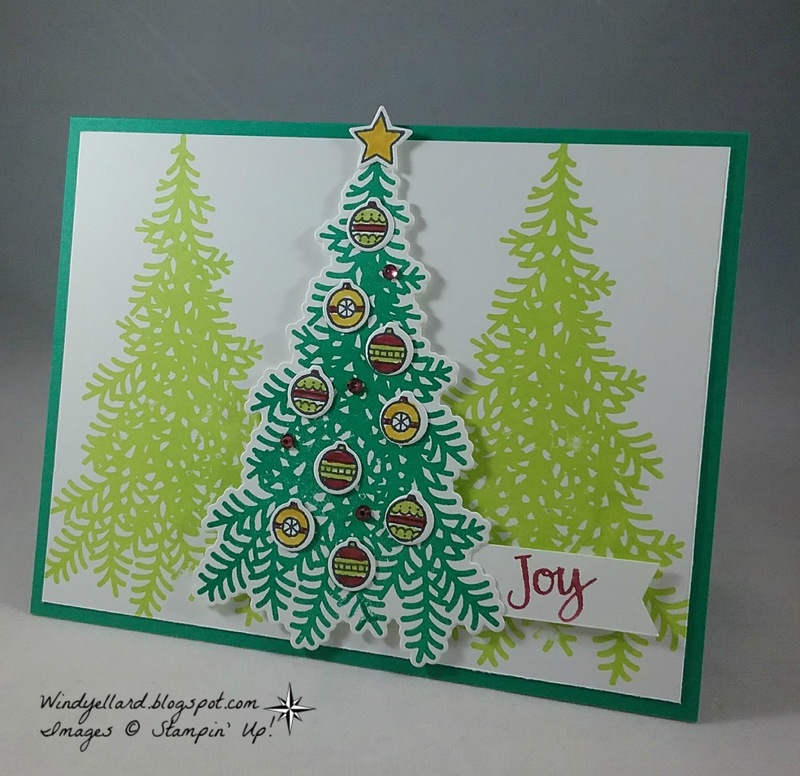 I stamped the background trees in Lemon Lime Twist on Whisper White. from the same set Ready For Christmas. them with markers-Cherry Cobbler, Lemon Lime Twist and Crushed Curry. I added some rhinestones I colored in Cherry as well for some bling. I stamped the star and colored it with the Crushed Curry marker. 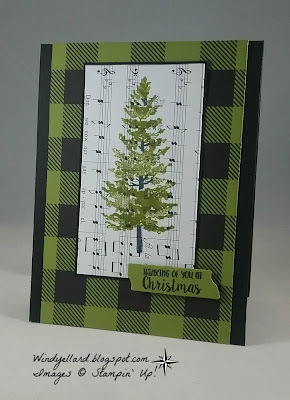 I have been hoarding the plaid paper from the Merry Little Christmas DSP. I knew what I was going to do right away. I layered the plaid on a Basic Black base. Merry Music DSP. I liked it with the music going up and down. 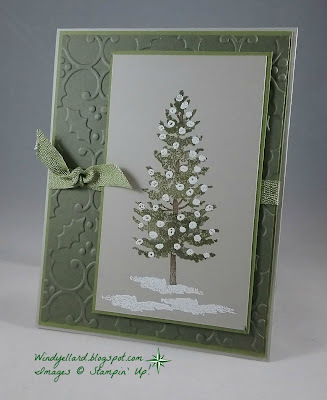 I stamped the Tree in Old Olive and the trunk in Memento Tuxedo Black. 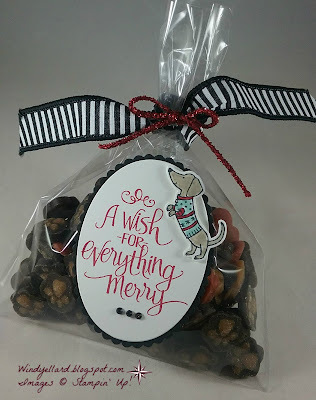 and cut it out with the wood looking die in the Mini Treat Bag framelits dies. I will send this to a male relative for Christmas so I do not really add anything else. 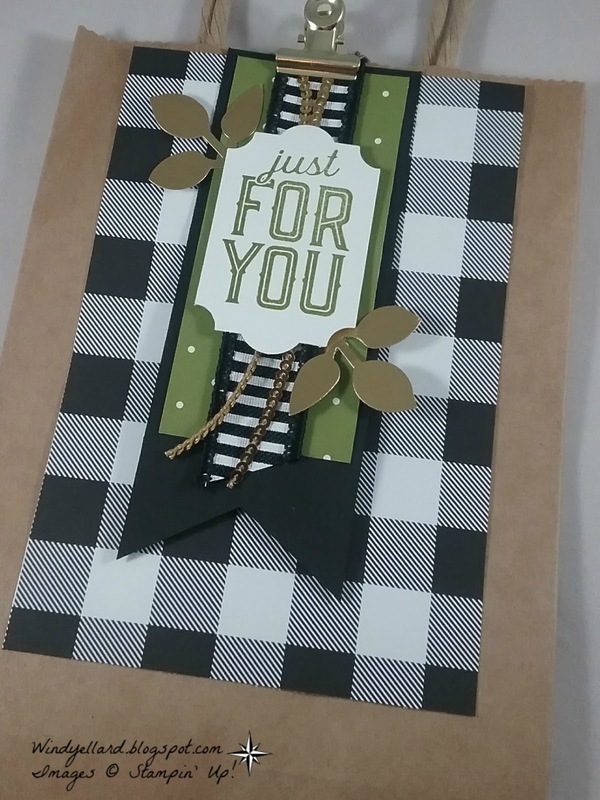 I made this card at WCMD 2017 in Atlanta. 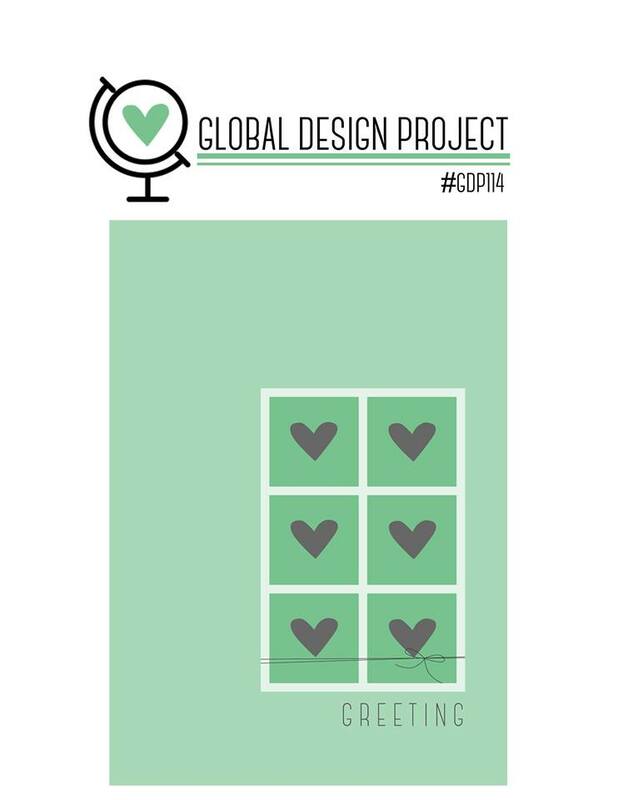 the World Card Making Day event last month in Atlanta. Emerald Envy and Lemon Lime Twist. 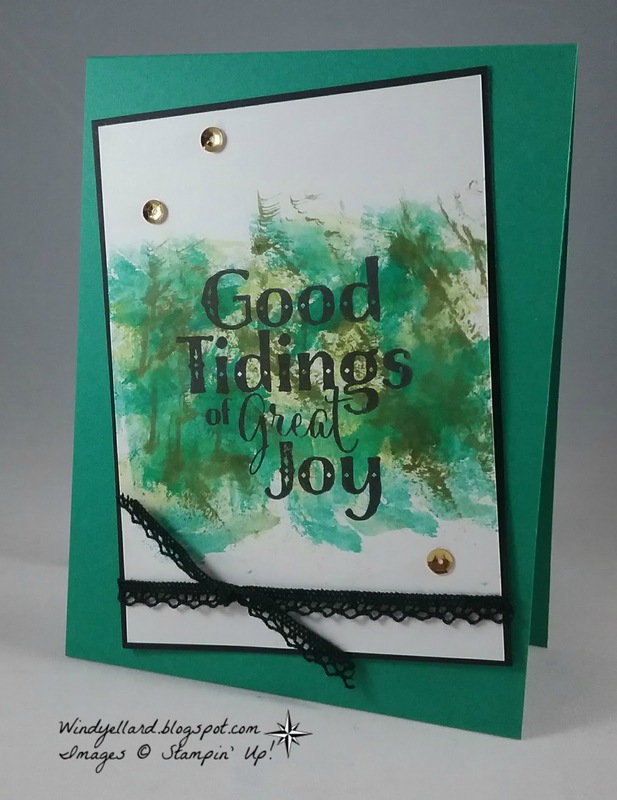 I stamped the wipe in each ink and applied to the card stock. I went a little heavy on mine but really like the effect. black vintage crochet trim. I placed some gold sequins for some bling. Hope you are inspired...have a great week! 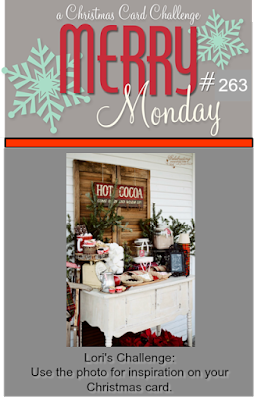 Merry Monday 263 Hot Chocolate! at the WCMD 2017 event I attended. only beverage I drink hot. cute so I had to add it to the mug! 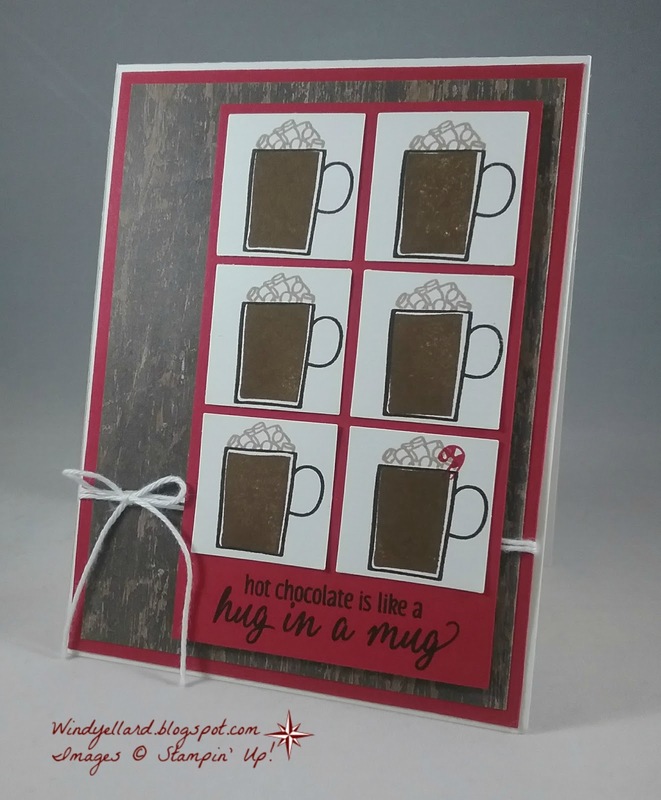 All the images are from the set Hug in a Mug. on a Whisper White Square. 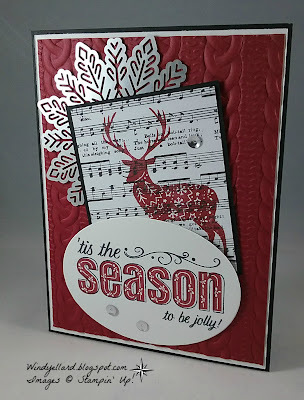 I layered it on a Real Red scallop square. 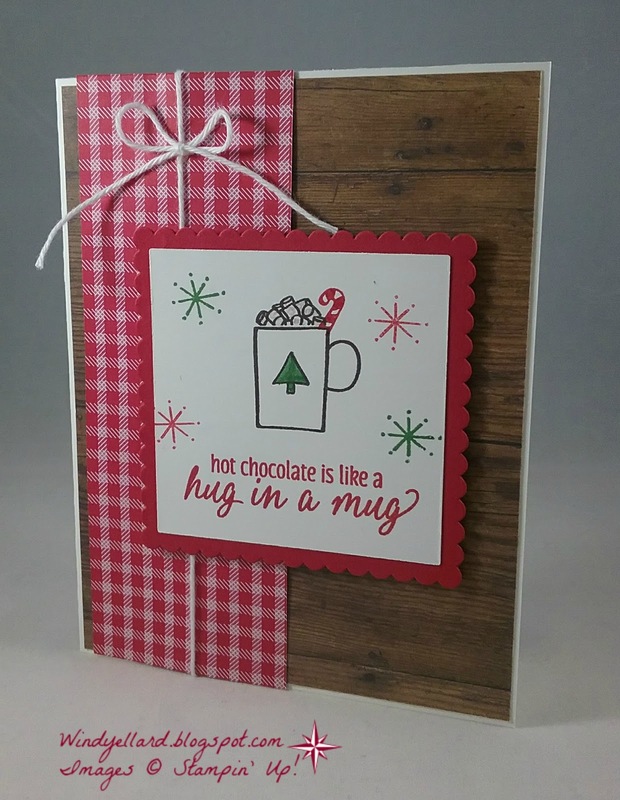 along with a Real Red gingham print from Quilted Christmas DSP. I added some white baker's twine to finish it off.